With Captain America: Civil War proving to be another huge hit for Marvel Studios, Scarlett Johansson has been propelled past Cameron Diaz to become the highest grossing female movie star in history. Perhaps this news will finally convince Marvel to move forward with an Avengers spinoff movie for Black Widow? The numbers are certainly impressive enough to give Kevin Feige and company food for thought anyway, as Johansson has earned a whopping $3.3 billion over the course of her career. A good chunk of that comes from the Marvel Cinematic Universe, but the actress has obviously also done pretty well thanks to the likes of Lucy, The Island and Hail, Caesar! among others. 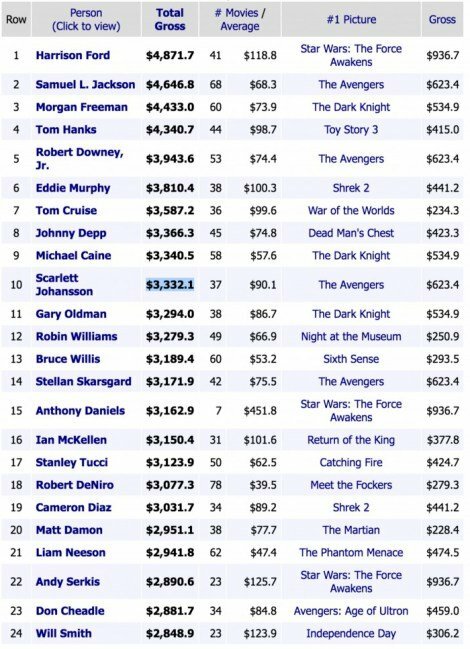 As of right now, The Avengers star ranks above names like Will Smith, Adam Sandler, and even Harry Potter alum Daniel Radcliffe. And, with Avengers: Infinity War right around the corner, chances are that the actress could very well end up cracking the top five. While some might argue that the success of movies like The Avengers doesn’t come down to any one cast member, there’s no denying the fact that Johansson is a major box office draw and an overwhelmingly popular part of this franchise and the MCU as a whole. Again, with that in mind, it’s hard not to wonder if the buzz this news has received will make a Black Widow movie a reality.